Just a quick note to point out that the HadCRUT4 data are now fully available for download. Feel free to discuss (or point to) any analyses you’d like to see done in the comments, and perhaps we’ll update this post with the more interesting ones. I’ve seen other comments that point out the variability of the data points, in terms of uncertainties, and also the recent study about removing temporary negative and positive influences on temperature, showing a definite continuing warming trend. Is there any chance of a comprehensive rebuttal of the above blog entry? This is a favourite of the fake sceptics. It is what I call cherry picking your starting point. They’ve started in 1997 not because they are looking for a 15 year window but because 1998 was a very hot year due to a massive el nino effect. What do the columns, except col 1 which is obviously year, represent in ‘hadcrut4_annual_ns_avg”? There are 11 of them so can’t be month, I need to know as I want to do a series of graphs showing how choosing your stating point aaffects the regression line slope (dramatically) if you only concentrate on the last two decades. I note that the data are only up to december 2010. What about 2011 and the beginning of 2012? The answer is that up to 2010 (where HadCRUT4 presently ends) it gives an increase of some 0.04 deg C.
This link should lead to a graph of HadCRUT3 & 4 10-year rolling averages. Additional to my previous comment, the HadCRUT4 anomaly in the 1970s has also increased (by a whopping 0.009 deg C) so 2010 is up by 0.031 deg C relative to the 1970s. I would be suspect of anyone who chooses particular starting (or ending) points to show exceptionally low (or high) warming trends. While the statement is true, it should be viewed in light of the longer data trend. Temperatures have been rising since the 19th century, with periods of greater and lesser warming (even cooling). I have not analyzed the new CRU4 data yet, but have done considerable work with CRU3. While the claim by some that the trend is negative over the past decade is true, the claim by others of the high trend of 0.18C/decade for the previous 30 years is also true. But as Paula mentions above, these are cherry picking. Over the long haul (130+ years), the temperature has risen at an average of 0.6C/century, with the previous high and low periods, preceded by similar high and low periods. > but have done considerable work with CRU3. Well, that’s a new claim. What work does “Dan H.” claim to have done in this field? “Dan H.” claims expertise in the science. This seems an extraordinary claim. Can it be supported? I’m not asking our hosts to break his anonymity, but to vouch for his claim that he’s done work in climatology. If we’re to trust people posting under pseudonyms, claiming expertise, someone’s got to vouch for them. If the right points are picked both before and after the huge El Nino of 1998, the slope line can be perfectly flat either way. That is because La Ninas around 1998 balance things out. When is the data expected to be updated beyond 2010? Ah, true to form, the last period in Dan’s period is only 10 years–of course starting in a bit El Nino. Nice to know we can count of Dan H. whenever we want a cherry to be picked. #10 Hank Roberts…There appear to be two Dan H.s…the more prolific one continues to post frequently to the Bore Hole. Anybody can use wood for trees to make linear plots which don’t show any statistical relevance, I imagine that Hank had hopes that “working with” the data meant something more, like, for instance, unlike everyone else you’ve managed to show that a 10-year cherry pick shows flat temps with statistical significance, just as a 30-year plot shows a rising trend with statistical significance, therefore vastly changing our knowledge of what statistical significance means in global temperature time series. Sadly, though, it appears that you’ve fallen short of my guess at Hank’s expectations. Not that this is anything new, you’ve played this game before. With regard to 15 year trend, it’s a test of whether or not global warming has stopped. The drawback is that it’s a completely unreliable test. And it’s very easy to show that. Pick a period over which there’s agreement that warming occurred. So, the globe warmed between 1950 and 1999, say, and we all agree on that. Take (in my case) the GISS series, apply the 15 year trend test successively to the years 1950 … 1985. 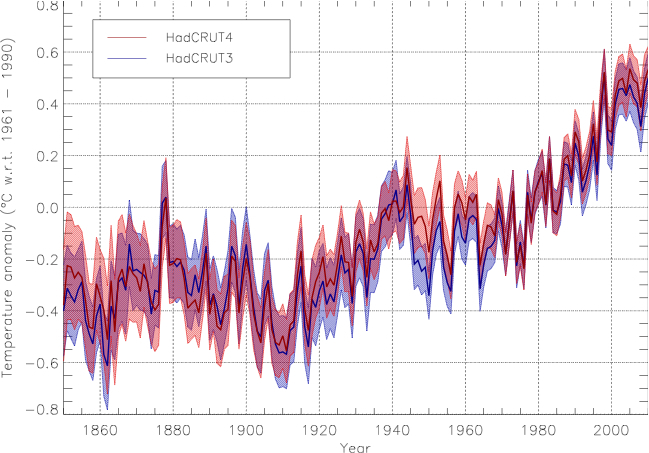 How reliably does the test show that warming is occurring? First observation: The test is modestly less reliable than flipping a coin if it is reported fairly, year after year. But it's only wide reported when it shows that global warming "has stopped". Once you've accounted for the "publication bias", it's totally unreliable as observed. I would call it a "stopped clock", but that does disservice to the clock, as even a (US) stopped clock is right twice a day. Second observation: For as long as you live, in slightly more than half the years, you'll see somebody telling you that global warming has stopped, based on that test. You missed all but the last one, Dan H.
Seriously — is this guy for real claiming he’s done climate science? Can anyone vouch for him? Or is he just an increasingly clever mimic? I saw this and I thought of you. Science and math can be such a pain. As long as you don’t need to be concerned about the science or math there are an almost infinite number of ways to prove that global warming/climate change doesn’t exist. Strangely enough, a “Dan H.” made several comments in the Tamino thread mentioned above, and didn’t impress anyone with his analysis. Some people in the Netherlands also were complaining that there was no significant warming over here over the last 15 years. When investigating the homogenised The Bilt series (KNMI), this is correct: no significant warming over 1997-2011. But two years ago there was significant warming over 1995-2009. Looking at the last decades, of all possible 15-year periods around half had significant warming and the other half didn’t. This indicates that warming isn’t a monotone process; no surprise at all. Aside, the last time there was significant cooling over 15 years was 1911-1925. But why looking at just 15 years? The WMO defines ‘normals’ as ‘Period averages computed for over a uniform and relatively long period comprising at least three consecutive 10-year periods.’ So why not looking at 30-year periods when the data is available? The Bilt (hom.) had significant warming over the years 1982-2011. The last time there was no significant warming over 30 years was 23 years ago (1959-1988). At #4 Paula Thomas asked about the columns in HadCrut data sets. As in previous HadCrut data sets, column 1 is the date and column 2 is the anomaly estimate (relative to baseline). The rest of the columns are various 5-95% uncertainty ranges (given in pairs). If one could harness the energy spent by fake skeptics bolstering their prejudices, it would provide a great deal of “clean” energy, though the pollution of time wasted doing so might not be offset. The up the down staircase graph gives it to you in one, if you will just pry open your mind a teensy teensy bit. Meanwhile, back at the ranch, could you guys return to doing what you do best – science? I meant to add in the energy spent in trying to open the door of knowledge by those who have better things to do as well to what is turning into a perpetual motion machine – though perpetuity is ill served by this nonsense. Oh, look! Isn’t it cute. Dan H. is teaching Isotopious how to cherrypick! Doesn’t this fall into the “it’s not a bug, it’s a feature!” class? After following the topic from street-level for about two decades, the first funny part about the ‘stopping’ argument is that temps keeps ‘stopping’. Every decade there’s been a claim that “it” is over, and every decade new global peaks are reached. It’s like the broken turn-signal signal joke. The second funny part is the focus on cherry-picking a start point, when the real card-trick is picking the end-point. The volume level of the stoppers is directly proportional to the inverse of current ENSO conditions. Add a couple of rough, cold anomalies in Europe when the Jet Stream short-circuits and, voila – the perfect low end-point to hook up to 1995, 1998, and December 2001.
fyi – that’s 2.5dC PER DECADE. I see you, for one, picked up my assertion that anyone can cherry-pick the data to post what they want to show. Some people have even gone so far as to change the slope of the past 10 (or 15) years to match the previous 30. Looking at the entire dataset, shows the folly in these type of displays. I really do not concern myself with Hank’s expectations. I doubt that. Someone would have noticed. Sure. The point the post makes (but also tries to hide) is that a 15 year period without warming is not a refutation of theory, but it REQUIRES AN EXPLANATION. It then drops the ball by not looking for an explanation. Well, “not looking for” is probably not right. Far far FAR more likely is that they knew about Foster and Rahmstorf 2011 (which completely answers your question) and chose to try to fool you by not mentioning it. So, google F&R, or just look it up here on RC. After that, come back and tell us what you think of the integrity of your source. Yes, this is about integrity, not scientific disagreement. Otherwise they’d have said, “F&R2011 is wrong because _____”. Lord, but I’m tired of this particular–claim? meme? folly? So tedious after the first couple of thousand times. “I meant to add in the energy spent in trying to open the door of knowledge by those who have better things to do as well to what is turning into a perpetual motion machine – though perpetuity is ill served by this nonsense”. I think this sentiment is worth more than a passing reflection and certainly deserves to be made known to a wider audience. Well said! Somebody should tell McIntyre, who has been silent so far. Expect him to write a post saying that “the team” is still hiding something. Folks, Dan H. in #9 was (by my reading) pointing out the folly of cherry-picking, not endorsing it. And I would agree with him on that point. It’s always possible to choose a non-significant period providing you a trend line of your preference, it’s just that doing so is a misrepresentation of the data. If anyone here hasn’t seen the Escalator graph, I would suggest it as a reference. Myself, I didn’t realise the GWPF had such an editor. There is no announcement of it on the GWPF website. And anyway, the GWPF claim not to hold any position on science (but then claims made by the GWPF are very seldom borne out by reality). Given it is supposed to be an educational charity, my own quite extensive researches (most recently published here) demonstrate the GWPF to be a singularly untrustworthy organisation. Yes, Don H. frequently chides us about cherry picking — usually, just before he presents a link to a particularly egregious, deceptively cherry-picked graph. Simon Abingdon, I’m pretty sure I’m not flattered. My sentence was rather gummy and the point could easily be reversed, which I assume was why you admired it. If you’ve had a change of heart, I’d like to know. For some reason, you find my amateur efforts easy to target, and provide lots of honey in the trap. I then suggested that I had failed to mention real scientists were being forced to waste their energy repeating obvious truths to try to get through the muck rather than continuing their excellent and necessary work finding out more about the truth embodied in our planetary circumstances. Brian Dodge @~33 – Speaking of amateurism I had fun changing the end year to later than 2005 and changing the database (from HADCrut3) which provided some even stronger illustrations. Thanks. Don’t even need to know much science to see the obvious there. Kevin McKinney @~36 – exaactly: so far, 4 cites of the elevator graph. Once more into the breach, dear friends, trying to get the truth out. There are none so blind as those who *will* not see. Thank you for being so observant. Sometimes, I think the reactionary response is too quick, and the full meaning is missed. If only. Dan H. muddies the discussion by confusing two different issues. One: sufficient data to have good probability of detecting a trend — not making claims using short time spans. Two: assessing changes in forcings associated with changes in climate — using data sufficient to do the statistics. If you “use all of the data” you can’t detect any change in trend from forcings known to make a difference (e.g. sulfate aerosols, which peaked in the 1940-1970 range from US sources and again later from Chinese). Using “all the data” precludes detecting change during the time span. Cherrypicking short term data precludes confidently detecting change. None of us want climate to change as fast as it’s happening; rather than grasping at straws, we inspect them — really closely — lest we be fooled by false hope and fake assurance from business-as-usual PR guys. No, he’s claiming that an interval that shows a statistically significant trend is “cherry picking” in the same sense that chosing an interval that does not show a statistically significant trend is. In other words, statistical significance (and by extension, statistical trend analysis) is worthless. He then moves on to say that the only trend that’s significant is the last 130 years, which he chooses because it conveniently leaves out most of the additional forcing due to mankind’s dumping of CO2 into the atmosphere, and various other reasons put forth by Hank above. Never fear, we understand your obsfucation perfectly. Thank you Paul Clark for your site. The original post invited us readers to ask for analyses. Paul offers both HADCRUT and CRUTEM v3 and v4 for comparison and invites people to compare them on his home page. Question for the statistically competent — can we say the trends are most likely different? dataset from Met Office Hadley. Here’s a quick comparison of HADCRUT4 with HADCRUT3. dataset from Met Office Hadley and East Anglia CRU. Here’s a quick comparison of CRUTEM4 and CRUTEM3. CRUTEM4 seems to have a markedly higher recent trend (2.8°C/century) than CRUTEM3 (2.2°C/century). Thank ye! Thank ye! Thank ye! You provide an invaluable service.